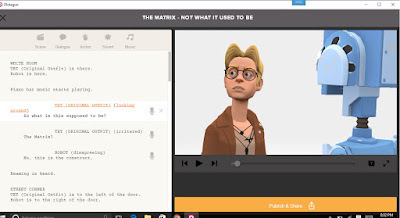 Plotagon, the free, type an animation app for PC, Mac, iPad and iPhone, has undergone a complete transformation since I last reviewed it in this blog. Gone are the more realistically stylised 3D characters and scenes in favour of a more friendly, 3D cartoon style. It's a style I really like so it prompted me to see what's new in Plotagon version 2. Note that I'm using the PC desktop app so this review pertains to that specifically. Right away I really enjoyed the new custom character creator. There's plenty of options to create very different looking characters, both male and female. You are limited in color choices for skin, hair, eyes and clothing, which is not a big issue but if you did want to use a very specific color scheme that isn't going to be an option. There's no option to adjust your character's height or weight so body types will all be very much the same however there is enough facial options to make characters look younger or older as needed. I really like that you can re-edit finished characters as well as work on copies of existing characters. Moving on to the Plotagon script editor, the basic idea is still the same. Creating an animation is as simple as writing a script. In fact the layout of your script is pretty much how actual scripts for film is set out. You start by choosing a scene and two characters that will interact with each other. There's plenty of free content to get you started or you can make in app purchases for more content if you add a credit card to your account. All scenes must contain two characters which are placed in any of the predefined positions available within the scene. From there you have the option to add dialogue, action, sound or music blocks to your script. Dialogue can include character actions or expressions, such as 'look around', 'sad', 'happy' etc. There's a generous range of character actions and expressions to choose from. If you want a character to pause and say nothing, just add a dialogue box with no dialogue (which also gives you the option to add a character action or expression without them speaking). All character voices are computer generated and are reasonably human like though they lack expression. There is the option to record your own voice directly into a scene however no option to upload pre-recorded voice clips (a real shame and something that should be added as a priority). Inserting just an Action will allow your characters to interact with each other if they are placed next to each other in the scene. There aren't nearly as many options here but what there is may be useful for many situations. Sounds can't be attributed to anything specific they're just heard. Music is just played until it finishes. Camera angles are automatically chosen and are limited to establishing shots of the scene followed by medium close up shots of each character as they speak. You can include multiple scenes within one story but there are no transitions between scenes - everything is a straight cut to the next scene. Unlike the first version of Plotagon there is no option to have your characters move around. Which is a real shame and extremely frustrating. If the characters could at least walk between their predefined positions within a scene it would make Plotagon animations a little more dynamic. You can preview your animation at any stage from any point which is essential to really refine the way the characters interact in a way that feels believable. Completed animations can be shared on Plotagon's network or you can export them to Youtube or share them on Twitter and Facebook. Below is my finished animation which is created mostly from purchased content (only my Avatar character that I created was free). Plotagon is so simple anyone could be up and running and using it inside 10 to 15 minutes. The characters look great, the scenes look great, there's plenty of content to get you started and more if you're willing to shell out a few dollars. Unfortunately it suffers from the same drawbacks as the original Plotagon. The scene placement of characters is so rigid, not being able to move them around at all is frustrating and no ability to choose camera angles stifles creativity (sometimes it's just nice to show a wide two shot while characters are talking to break up the over the shoulder interview style dialogue shots). Plotagon is a great way to pass the time if you're willing to create stories based around the content available in Plotagon's library. There's no option to upload your own scenes or even customize existing scenes. Finished animations can look a little same-y and sound a little bland with the computer generated voices. It's great though if you want something that will work on your phone or tablet while you're on the go. It's also good if you have a thing for writing two person conversations. If you're a little more serious about animating and want more flexibility to express yourself you might go for something like Muvizu over Plotagon. However, I have to say I like Plotagon's character style much better. Plotagon is fun. It'll pique your interest for animation but ultimately you'll out grow it if you ever get more serious about your script writing or creating animation. Seriously, I think I will check this program out. Thanks. That was as close to Donald Trump as I could get. None of the head shapes really matched his actual head but the hair is spot on other than it could be a little lighter shade of ginger. 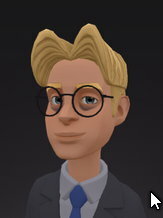 David, I am sorry but I don't feel you are giving plotagon a fair shake here. Well, I wrote you before because the review was years out-dated and really appreciate that you went back and saw all the great changes made to plotagon. But this review is now 2 years old and a lot changes in plotagon in 2 years, sometimes each month is full changes and better updated stuff in plotagon. Although this review is much better than the last one, plotagon is an app that keeps growing. I am myself someone who cannot do the detailed animation as many people (Kids and adults) just can't get the hang of. I tried all the other animated apps, and either it was to complicated to figure out. or it was more of an app with very unrealistic looking stuff. Plotagon does all the animation for you, all the tools are there, you just write the script, choose scene, characters etc ... there is really no work at all involved. Also, there are many free items and they are added to all the time. (Plotagon story) is totally free to download and use. The app comes with many free stock characters, free scenes, free emotions to use, and is free to publish. Thanks for your detailed response Rose. Based on what you wrote I did spend the afternoon exploring the latest version of Plotagon for the PC Desktop. Aside from the addition of camera movement and the ability to choose from a range of set camera shots within a scene there wasn't really any significant difference between now and when I wrote this review. You're still limited to two characters per scene despite the ability to make it seem like there are more people using a bit of editing trickery (or adding non speaking extras to some scenes). Don't get me wrong, I do like Plotagon. It's just not flexible enough for my needs and the stories I want to tell. For example in this review I was complaining about a lack of camera movement and the ability to choose shots, clearly Plotagon has listened (I'm sure I wasn't the only one complaining), it's good to see that improvement. Perhaps the next big upgrade would be allowing characters to walk from one mark to another within a scene as an action. Currently if you want characters to move around within a scene you have to do it with editing tricks. Despite the wide range of new content and the deals to get most of the paid content at a single low price there's still no way to bring in custom content or to customize scenes with custom content. 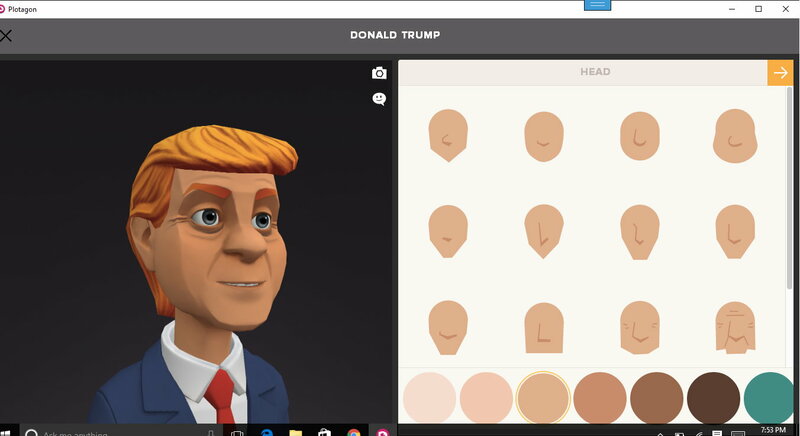 Plotagon is a fun application, and it has improved. It's just not there yet in terms of what I want to do. But if you're happy with it then that's great. Don't let my review spoil your fun.